Pens are a product that everyone is forever looking for. They are always helpful to have around, they are also provide you a good opportunity to give a great promotional product to your clients. If your company has a custom printed pen with your business information your branding will be reinforced use after use. You can give a quality custom printed promotional pen as a present or keep a boxful of low cost printed pens to lend to clients when they ask “have you a pen I can borrow “ and regularly leave with it. This is great if they do take a pen with your business details printed on it, as your information is constantly in front of them each time they use that pen to write or take notes. It could end up anywhere! We have catered to your requirements with a huge variety of promotional pens, with quality custom printed pens from as low as .69 cents each. This comprises a one colour print (+ a set up cost ) Feel free to look through our plastic pen assortment below . For larger images and more information about each pen please click on the thumbnails below. Solid ergonomic design is a major selling point for this pen. A soft rubber finger grip and metal features will impress your clients who will be pleased to receive and use this stylish writing instrument. A low cost, stunning personalized pen with the option to mix and match colours between it’s parts. Its far-reaching new innovative design allows you to promote with a stylish, high quality pen at an unbelievably low cost. 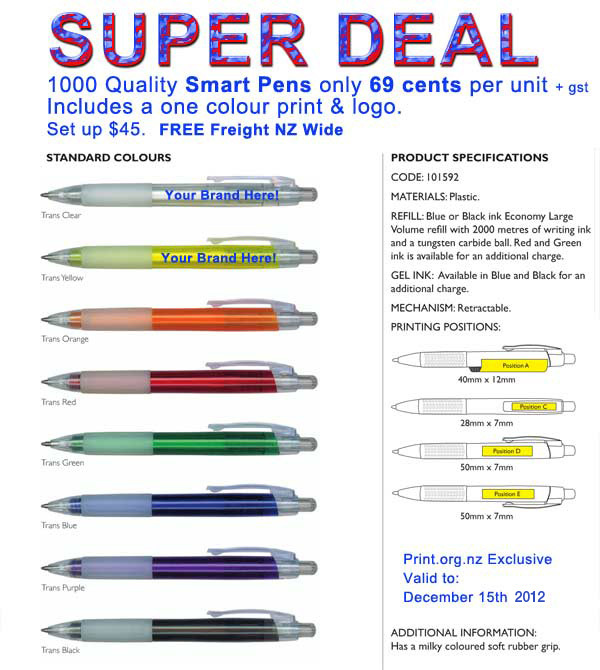 An excellent well priced pen that comes in an enormous variety of colours. Very comfortable to hold in your hand. You would be pushed to come across any superior valued pen anywhere else! A stylish contemporary design with a frosted finish. The luxurious rubber grip at the front of the pen this ensures you’re always in control of your penmanship. This pen is a certain eye catching winner. Another great looking chunky pen. This pen will keep you writing page after page with the 1200 plus metres of black ink. With printable areas that guarantee great coverage for your brand. Large barrel that really gives you a larger printable area to get your message to your market. The milky coloured soft rubber grip at the front ensures you are in control at all times. A plastic and metal design accompanied by the unique “co-moulded” grip area with a trim of metal. Very noticeable and eye catching this pen will bring attention to your details printed on the barrel. This pen has an inspired design that is centred around the co-moulded barrel and combines frosted and white plastic materials in the manufacture. An excellent way to get your brand seen in the market. The soft rubber grip tops off the metallic finish in Silver and Black. Printed with your logo and contact details is great way to impress your clients and keep your business image in front of your customers. With more than 100 colour combinations and a patented push click mechanism this German manufactured pen has a large printable area to ensure your logo is always seen. In more than 80 colour combinations with the added style of a frosted translucent finish. Great printing options ensure your brand will look fantastic along with the design of this pen. A quality well priced pen that comes in a vast choice of colours 2000 meters of writing ink and a tungsten carbide ball. A translucent clip and soft rubber grip finish this tidy little item off nicely. This pen is a delight to write with, a soft rubberised finger grip compliment the large barrel. Can be mixed and matched into 144 colour combinations. With this pen your logo and details will be in front of your clients at all times. Extra flashes of chrome catch the eye. More than 1200 meters of writing ink will ensure this pen will be useful gift to your clients. A chunky barrel and co-moulded plastic clip go together well with the translucent soft rubber grip. Attractive, comfortable and great value, your clients will be very happy to be given a pen like this. Manufactured in China to exacting European standards this pen sports a great shape and funky, fun colour schemes and soft rubber grip for hours of writing pleasure. With a sturdy plastic and metal construction this pen not only looks great but will endure the rough and tumble of the life of a pen and easily last the 1200 meters or more of black ink that comes standard with this pen. With mix and match colour options and a clip activated retractable mechanism, this simple yet eye catching design makes a great give away to accompany your marketing plan. Ample area for your logo or sales message. This pen has a clever clip that can be used to fix the pen to a keyring or lanyard. The pen swivels in and out of the clip and locks in position to ensure you can write comfortably. A low cost reliable pen that offsets is large colour range with black finger grip, clip and click mechanism. These pens are such great value you can afford to give many of these away. The same pen as the Sprite Coloured Barrel with the colour scheme reversed. The large variety of colours are placed on the finger grip and the clip while the barrel is a brilliant white. This pen has an interesting ergonomic shape that feels ultra comfortable in your hand. The smooth retractable mechanism has a satisfying click that locks the pen in it’s on or off position. The transparent Trans Jet pen will let you fly through your written work. Ultimate comfort is provided by the beautifully shape soft touch rubber lacquered grip. Strong design and strong materials deliver a great look pen that’s wonderful to use. With over 2000 meters of writing ink and the super comfortable soft finger grip make this a great value pen purchase. A larger diameter pen with a soft rubber grip and a large click mechanism for easy use. Imagine your logo and details occupying the large printable area. Great value -great looking – great pen! With all the same features of the standard Matrix, this version has, as the name suggests, has a metallic finish instead of the translucent body. A nice looking pen with great features. Another interesting European design that says “this pen is different” and this difference will say something good about your company or organisation when you choose this great value item. Another pen with soft milky coloured grip and a transparent yet coloured barrel. A nice comfortable pen to use with plenty of room to print your branding, logo, sales message or contact details. Beautiful clean lines and fantastic colours make this a great choice as a promotional gift for your clients. This pen has the largest print area of any plastic pen. With a combination of plastic and metal, this pen has feel of a pen in a much higher price range. The soft rubber grip and metal accents present an attractive platform for your branding or contact details. Great Value only 79 cents each plus gst on 1000 units. Red, blue or black at the flick of a switch, the Multi Pen is a must for someone who needs different colours at their fingertips. The soft rubber finger grip makes this a very comfortable and prcticle pen. Before ordering please read our Terms of Sale. We look forward serving you with a top quality service and product. We you actually looking for USB Pen Drives?